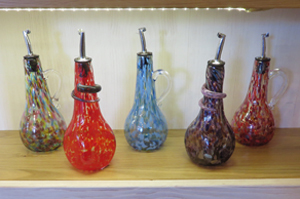 Over the centuries little has changed of the tools used to create blown glass objects like these by Dottie Boscamp. Before I started learning about artisans and their work, the only breakthroughs I could have named that brought more goods to more people would have dated from the Industrial Revolution . . . the wheel and agriculture being my only exceptions. Reading about potters’ wheels last month, I learned that mechanisms to increase their rotating speed had created a mini-Industrial Revolution a few millenia ago, making it possible for many people to own pottery. This month I learned that what the mechanized potter’s wheel did for pottery, the development of glassblowing did for glass – to some extent, anyway. It still is a painstaking craft – and a very hot one at that. I was grateful for the cool morning air the day I went to LaPorte, a small town northwest of Fort Collins, to watch glassblower Dottie Boscamp at work. 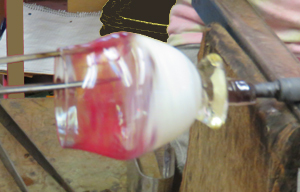 Dottie Boscamp swings glass from the end of her blowpipe to let gravity help her shape it. When I walked into her Glass Rocks studio behind her home, Dottie was swinging what appeared to be a small glass vessel in an arc above the floor. The glass hung from a blowpipe, the hollow pole a few feet long through which Dottie had blown an opening in the molten glass. 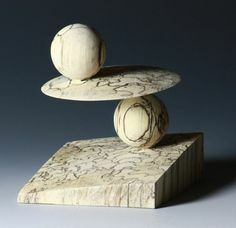 She was letting gravity extend the size of the bowl she was making – though it looked nothing like a bowl at the time. Suddenly she thrust the glass through a hole in the gas-powered furnace known by glassblowers as a glory hole. 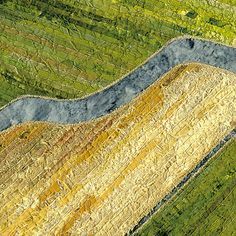 Dottie explained that the term was adopted from gold mining, where it refers to an opening to a rich vein of gold. Brilliant yellow light reflected everywhere inside the glory hole at Glass Rocks, and the glass on the end of Dottie’s blowpipe immediately turned red in the intense heat. 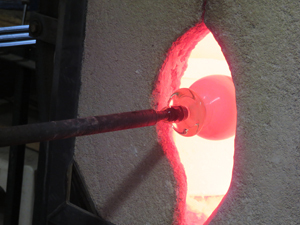 The opening of the gas oven known as a glory hole remains open while glassblower Dottie Boscamp works. The glory hole remained open through it all, and I wondered how Dottie could bear its heat on hot summer days. The heat that shocked me, though, came from her electric furnace. The blast at 2,000 degrees Fahrenheit was unbelievable. I was several feet farther away from it than Dottie was when she opened it to retrieve molten glass for the foot of her bowl. The bowl, still shaped like a simple vessel, clung to the end of the blowpipe as Dottie lowered it gently into a small blob of glimmering hot glass. In Dottie’s skillful hands, the blob soon became a perfectly round base. Only after she attached another long pole to the base and removed the blowpipe, however, did I begin to see a bowl form. Dottie Boscamp gently coaxed warm glass to open widely where a small hole had allowed her to blow into it. Using tools that hadn’t changed in centuries, Dottie carefully enlarged the hole through which she had blown. More trips to the glory hole kept the glass workable. Suddenly Dottie stood with the pole hanging down in front of her and twisted it gracefully this way and that. 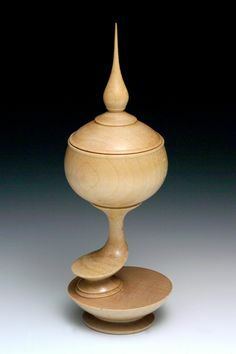 When she raised the pole up, the bowl I saw astounded me – it was fluted with perfect symmetry. Now That It’s Cooler . . . The bowl showed its true colors by the time Dottie cut it off the pole on which she had formed it. 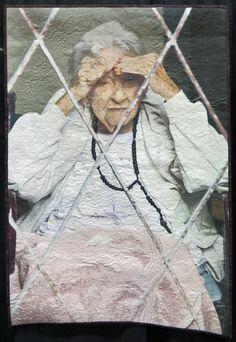 She had rolled one end of the hot glass through a small pile of cobalt blue frit (crushed glass) that had melted into streaks of red and purple while she worked. As the bowl cooled, the streaks changed to cobalt blue, swirling gracefully around clear glass. 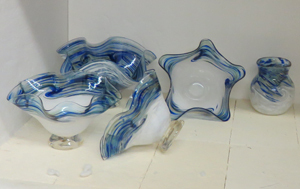 Dottie Boscamp’s blown glass bowls cool slowly in a kiln at her Glass Rocks studio to prevent cracking. Only the lower half of the bowl didn’t change color. Dottie had rolled it in white glass ground as fine as powder. In the glory hole the powder had fused with the hot clear glass, but the color remained white. She had skillfully manipulated the hot white glass so that it appeared to crest like waves below the swirling cobalt blue. This new bowl joined several others like it in a warm kiln. 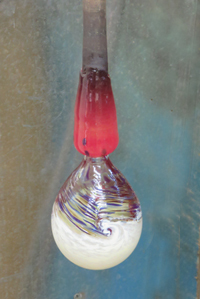 Warm, when you’re talking about newly blown glass, means about 900 degrees. 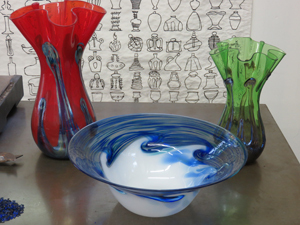 Unlike pottery or fused glass that starts in an unheated kiln and reaches 1,500 degrees or more before cooling, blown glass doesn’t need additional heat. Instead, it needs an environment that allows it to cool slowly so it won’t crack. Now that she had completed a gallery’s order for bowls, Dottie started on an order for 20 spice jars from Crescendo, an oil, vinegar, and spice shop in Fort Collins. While I watched she made the first of them, carefully sizing the opening for a hefty cork stopper. When it was finished, she placed it in the kiln with the bowls; you can see it on the far right in the picture above. Today Dottie’s spice jars are for sale at Crescendo, 123 North College Avenue, Fort Collins. Her cruets for oil and vinegar are already on display there. 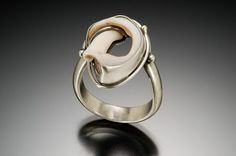 You can also find her work at several galleries along the Front Range: Trimble Court in Fort Collins, Stonehenge in Georgetown, Mountain Living Studio in Manitou Springs, and Luma in Colorado Springs. 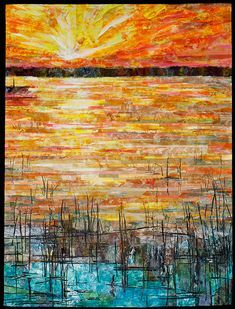 Her own online gallery displays an amazing variety of work. Click on the “glassware” tab to see all the categories, then click on a category to see what she’s offering. To order, go to the “Contact” tab to ask Dottie for more information. Before you do, you may want to watch the one-minute video on the Glass Rocks home page. There you can see Dottie working at her glory hole for yourself. Have you signed up for e-mail reminders of new posts on Handmade on the Front Range? Your address won’t be used for any other purpose. Look for the sign-up box below “What’s Happening” in the sidebar at right. This entry was posted in Glass and tagged Crescendo, Dottie Boscamp, glassblowing, glory hole, LaPorte on September 17, 2014 by Sally. Very interesting. Sounds like a complicated craft. 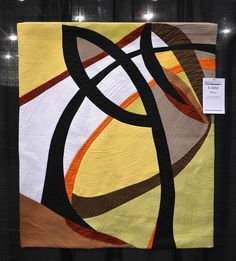 Beautiful creations! I know Dottie will appreciate your comments, Carol.